Alright, so- I need to start this review off with a bit of backstory, because this show has been a long time coming. Free! 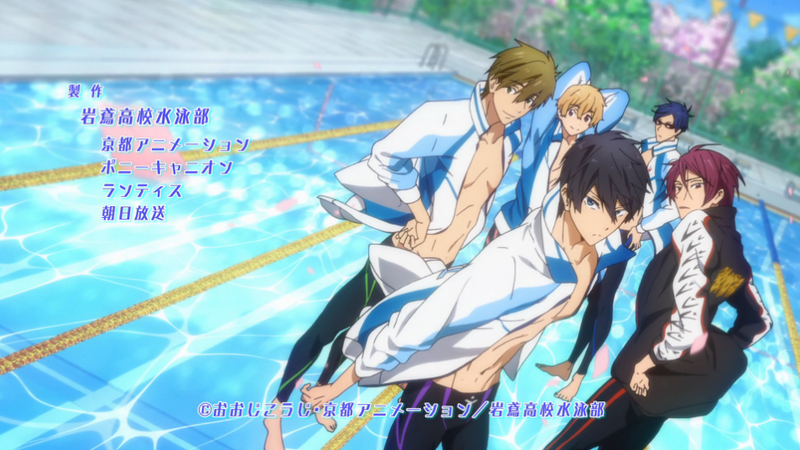 Iwatobi Swim Club is the anime that fangirls the internet over have been waiting for. 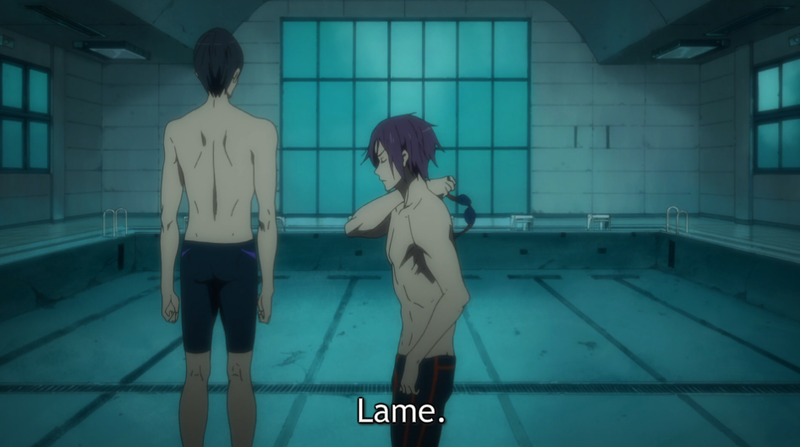 Formerly known only as “that swimming anime,” Free! first made waves (pun intended) when it premiered as a short promotional video by Kyoto Animation back in March. The 30 second clip featured well-animated shirtless boys frolicking around half-naked in or around a pool, being attractive and having an amazing time. Naturally, the internet went wild either A) laughing at the gratuitous fanservice, B) enjoying the display immensely, or C) all of the above. But the future of this mysterious swimming anime was cloudy at the time. Would it become a show, or was it destined to be limited to 30 seconds forever? Back in April, Kyoto Animation finally answered that question to the delight of fangirls everywhere: yes, it’s going to be a show. It’s based off of a novel called High Speed! by Kōji Ōji, and it’s going to be exactly what the PV promised: attractive young men swimming. 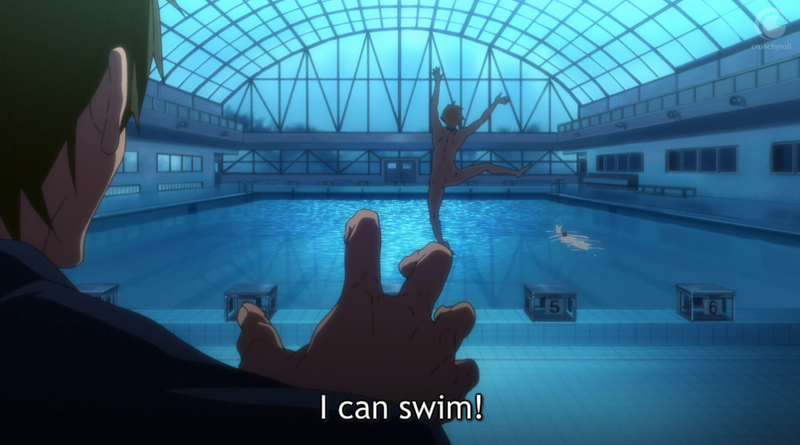 And now, ladies and gentleman, the promised day is at hand: episode one of that swimming anime, Free! Iwatobi Swim Club, is here. Does it live up to the hype? Let’s find out. Free! opens up with the backstory of childhood friends Haruka, Makoto, and Hazuki. They were all members of the same elementary school swim club, along with transfer student Rin. The boys formed a close friendship over the sport. – and then he grows up. Now in high school, Haruka no longer swims on a team and seems disillusioned with the idea of being devoted to swimming, though he still craves the sport. When it’s too cold to swim in the ocean, he soaks in his tub as a poor substitute for an actual pool. 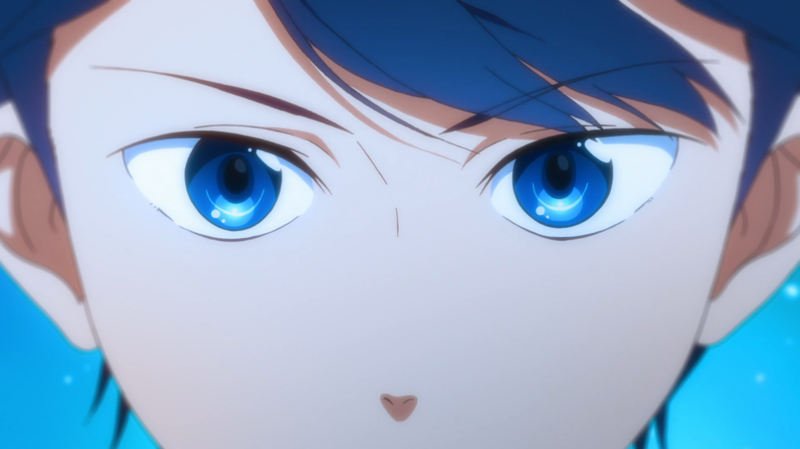 When Haruka and Makoto are reuniated with Hazuki once he becomes a freshman, they all return to their elementary school one night to dig up an old momento: a trophy they all won together along with Rin before Rin moved to Australia to attend a special school to prepare him to swim professionally. Unable to decide who should keep it, the boys buried it in a time capsule to reclaim when they were older. The old club is due to be torn down now, so they figure this is the perfect time to find it. 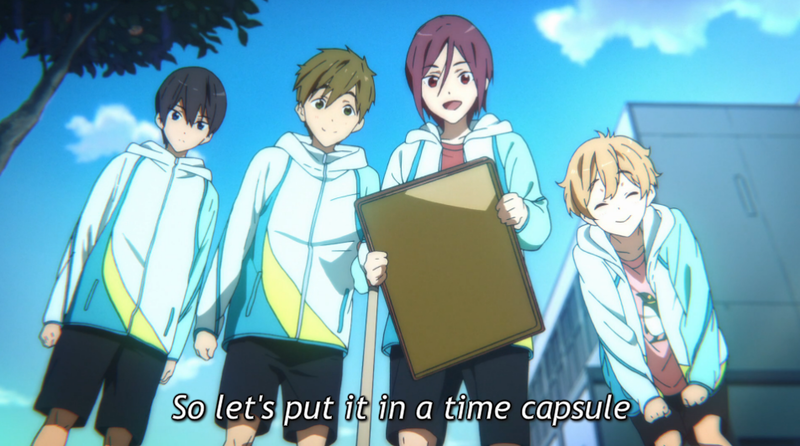 But the three boys are shocked to find out that Rin himself got to the trophy first. He’s back, but he’s not the Rin they used to know. This Rin is cold, sharp, and seems to have a serious issue with Hazuki. One of the best parts of this episode is when they decide to have a heated swim match in the old elementary school pool (complete with ripping off their clothes down to their swim gear- and no, that’s not a metaphor for anything) only to find out right before diving in that the pool is completely dry. What happened to Rin? Why is he so bitter and mean? The next day the boys make a visit to Rin’s private school to try and figure out the mystery. They run into Rin beside the school’s pool, and the episode ends on the brink of another rivalry-fueled swim match. Before I say anything else, let it be known that the animation for this show is gorgeous. It looks a lot lot like K-On! so far as the style goes. Every movement is fluid, and the character designs are a fangirl’s dream. Full marks on that. I had a lot of fun watching this first episode. The characters could be separated into their bishounen cliche boxes pretty cleanly, but despite that they’re not nauseatingly stereotypical. They’re all pretty lovable in fact, excepting Rin and his prickly personality. There is one thing that the show does indulge in though. And if you’ve been paying any attention at all, you won’t be surprised. Free! boasts fanservice on several levels, the most noticeable being that these boys will take off their shirts without a second’s notice (Hazuki taking off a little more than that; thought to be “the shy one” when the PV first came out, he’s pretty much disproved that by skinny dipping at the end of this episode). 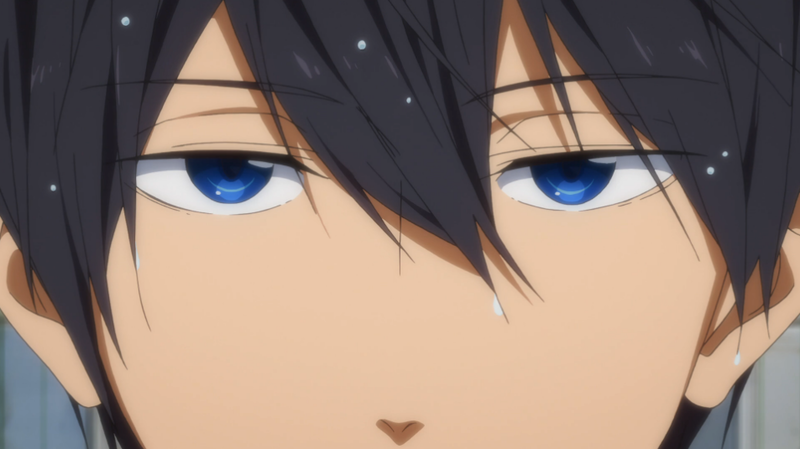 Haruka will strip down to his skintight swimsuit as soon as the prospect of swimming is brought up. 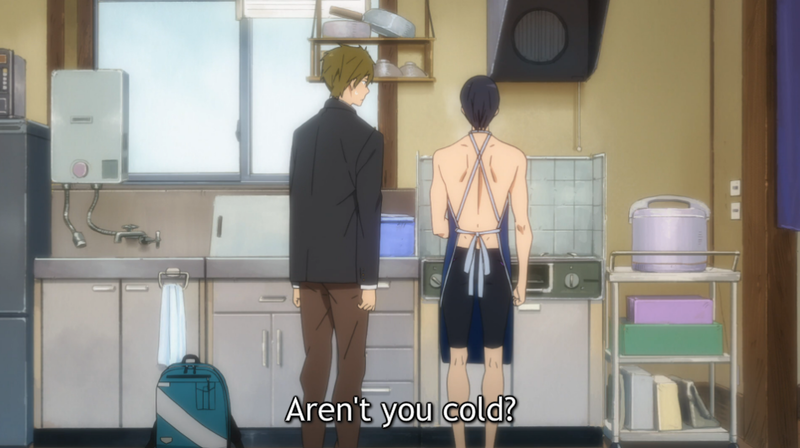 He actually seems much more comfortable in his swimsuit than his clothes, which Makoto points out several times. There’s also the fact that these are four boys who are close friends (or even better, bitter rivals) who are affectionate and spend a lot of time together. If you can’t hear the fangirls squee’ing from miles away, then you are deaf. I admit, this sounds like it could make the show sort of obnoxious. If you have zero tolerance for fanservice at all, you might agree. What surprised me though was how much I liked the show disregarding the fanservice element of it. The first episode does a good job of characterizing everyone. The jokes are funny, the plot is solid, and did I mention that the animation is beautiful? Free! has a lot of fanservice, but it doesn’t rely on fanservice to hold up the show. Everything else is good in its own right, and I’ll say it again: I had a lot of fun watching episode 1. A quick note about fanservice: We see a lot of visual fanservice for heterosexual males in anime. I mean, a LOT. Even your average series will probably have some scenes you wouldn’t want to show the folks at home. But fanservice for heterosexual ladies that is created to the same standard is really, really rare. What Free! brings to the table isn’t over the top when compared to a large chunk of anime already out there- it just has a different focus on gender. Free! Iwatobi Swim Club lives up to everything it promised in the first place. It looks great in every aspect, from the smooth animation to the attractive character designs. But what really makes the show are the loveable main cast and the genuine sense of humor (and if you find the fanservice more funny than alluring, then you’ll really be laughing). Fans of bishounen anime with obvious slash potential will most certainly enjoy the show; but in my opinion, so will plenty of others. I’m definitely going to keep watching. Check out episode one for yourself at Crunchyroll!